October 1st is National Homemade Cookie Day, and our sweet tooth is ready to celebrate! 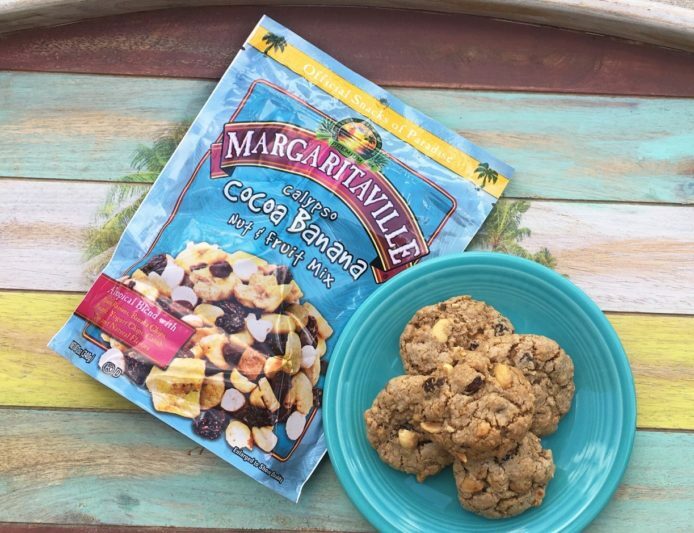 The key word in this holiday is homemade, so rather than cheat and purchase a box of cookies from the store, try this cookie recipe with a tropical twist using the Margaritaville Calypso Cocoa Banana Nut & Fruit Mix. The mix adds a sunny, sweet fix with a delicious blend of fruits and nuts for a taste of paradise. These are sure to become a favorite recipe — whether you’re at the beach, at work or showing off your skills at the local bake sale. Preheat the oven to 350°. Cream together the butter, brown sugar, white sugar, and egg. Mix until smooth then add in the flour, oats, cinnamon, baking soda, salt and cornstarch. After the dough is completely mixed together, lastly add in the Margaritaville Calypso Cocoa Banana Nut & Fruit Mix. Scoop cookie dough with a large cookie scoop and roll in between palms to make round. Place on a cookie sheet covered in parchment paper and bake for 14-17 minutes or until edges are lightly browned. Let cool for 5 minutes on the baking sheet before moving them to a wire rack to cool completely. Hungry for more? Visit our recipe page for more island inspired recipes.